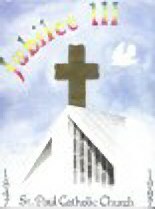 “Jubilee 3," an illustrated book, covering the history of St. Paul Catholic Church from 1847 to 1997, was written by Dan Ellis in conjunction with the church's 150th Anniversary. The book is enriched with many drawings and photographs contributed by parishioners who faithfully answered the call to browse through their attics and closets. There are pictures of Pine Hills Hotel and the Grey Castle Hotel, the former located on a site that is now part of Dupont, was converted to a Catholic seminary. The latter became a retreat home for the aging Catholic clergy. Also featured are pictures of priests, choirs, altar boys, masses, students, scout troops, athletic events, Mardi Gras royalty, parades and balls – all the activities that shape the lives of St. Paul's parishioners. Early Catholicity in Mississippi and the Gulf coast is developed with the creation of the Diocese of Natchez in 1837, followed by the appointment of the first missionary priests to offer masses at Bay St. Louis, Biloxi, and Pass Christian. The sesquicentennial is divided into three 50-year periods and their progressions through time with the construction and replacements of churches in 1851, 1879, and 1972. The book is divided into significant chapters: The Church, the School, the Faith based community, the Cemetery, the past Memories, and a brief chapter on the town and its pertinence to the church.